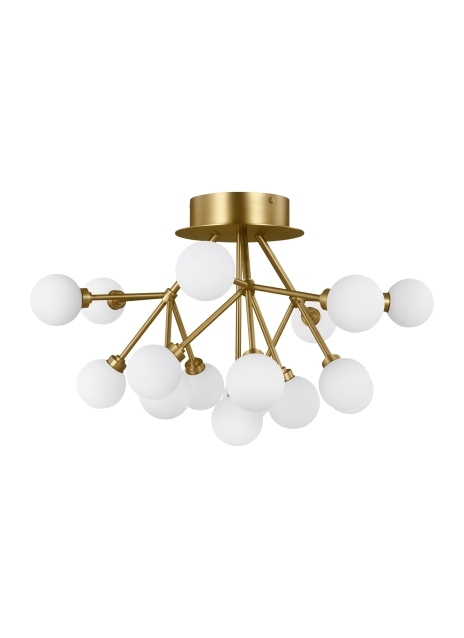 The Mara ceiling mount by Tech Lighting is a scaled down version of the chandelier with three arms extending clusters of frosted glass globes illuminated by a smoothly diffused LED light source. Offered with energy efficient integrated LED in three distinct finishes, the Mara Ceiling is a modern solution to your dining room, living room, bedroom and hallway. Complete the look with the Mara wall sconce, pendant and chandelier for full room coordination. Lamping options are compatible with most dimmers. Refer to Dimming Chart for more information. Includes (16) 120-277 volt universal 2.6 watt (41.6 total watts) 1072 total delivered lumens, Dimmable with most LED compatible 0-10V dimmers. Ceiling mount only.